Just like ice cream, I have another love-hate relationship with anything deep-fried. While I can still say no to ice cream sometimes, I usually will succumb to their crispy coating and that oily satisfaction when eating deep-fried food. Every cuisine, be it Chinese, Korean, Malay, Japanese, Vietnamese, Thai, American, Italian, French etc, will definitely have some food that is deep-fried. 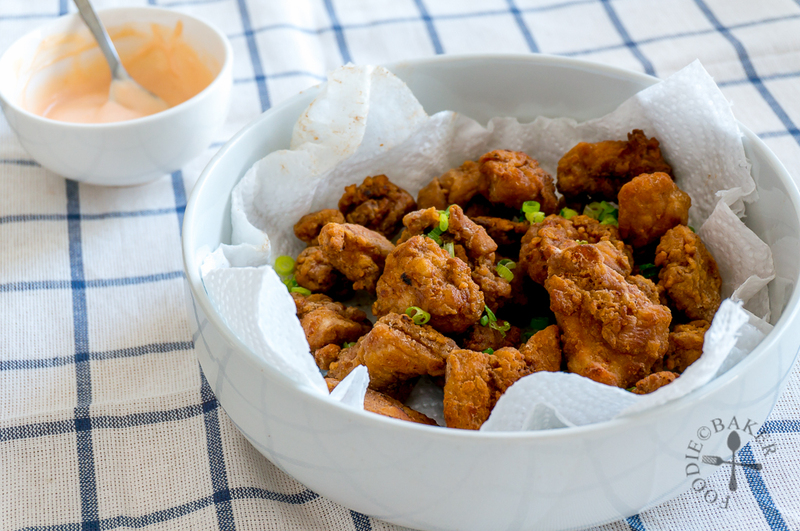 Today I’m sharing the recipe of one of my favourite deep-fried food – chicken karaage! 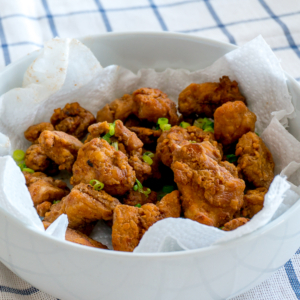 Karaage (唐揚げ / 空揚げ / から揚げ) is a Japanese cooking technique in which food are deep-fried in oil. The meat is usually marinated in a sauce, then coated with a seasoned wheat flour or potato starch before frying in oil. Deep-frying may sound scary and messy, but I think there are just two main tricks to get deep-frying right: right temperature and don’t fear the oil. It’s so hard to make them look good in photos, but we sure know they taste good, don’t we? P.S. This is a scheduled post as I’m currently away on holiday! Thank you for visiting and my apologies as I won’t be able to visit your blogs during this period. Do follow me at Instagram (@foodiebaker) to see what I am up to in Switzerland! The oil must be hot enough before you add in the meat or vegetables so that it becomes crispy. I double-fry the chicken karaage too, which is what I do nowadays. The first fry in batches so that the oil temperature will not drop too much, the second fry all in one go on a very high heat to get the meat or vegetables really crispy. The only times that I won’t double-fry is perhaps when I’m making tempura, or if the meat is going to be braised or stewed. I like to use a thermometer to measure the oil, just make sure they don’t drop in the oil – speaking from experience here. Sometimes when I’m lazy I’ll use the wooden chopsticks method (more information in the recipe below). When I first started deep-frying food, I had the tendency to drop the food from a height or worse, throw the food in. This resulted in hot oil splashing everywhere, ouch! You want minimal impact when the food hit the oil because – less impact, less oil splash. 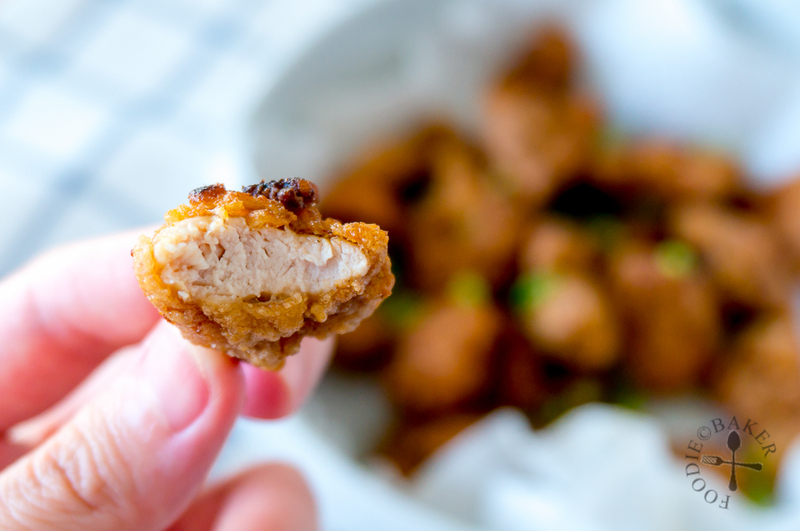 If the food is small, like the chicken karaage, use a pair of tongs or chopsticks to lower it into the oil. You can just submerged the tongs or chopsticks into the oil before releasing the meat, if you are new to deep-frying. For big food like chicken drumsticks or fish fillets, I find it’s easier to use your hand to dip the meat into the oil on the end that is near you, then lower it away from you and releasing it when your hand is close to the surface of the oil. You can use tongs or chopsticks, just make sure you have a good grip on the meat! For more tips on deep-frying you can check out this article on SeriousEats! 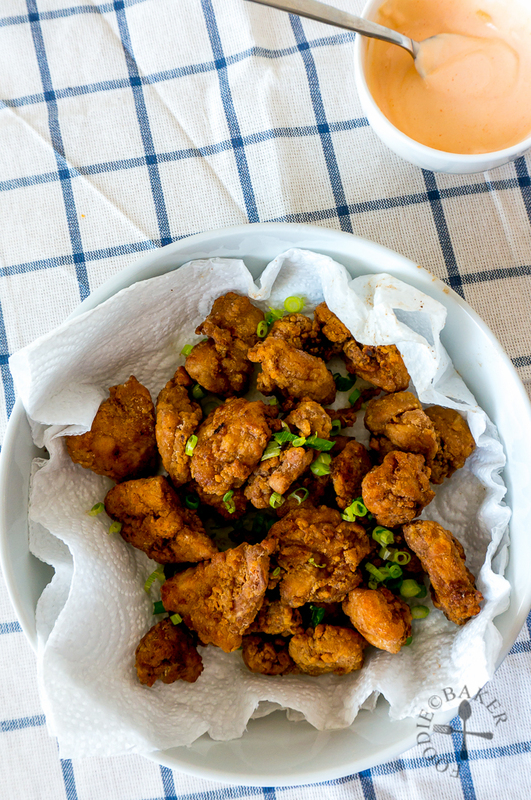 No doubt there will still be a bit of mess in the kitchen at the end but I wouldn’t mind doing it once every blue moon because biting into a crispy piece of chicken karaage is just pure joy! Let’s walk read through the step-by-step photos! The chicken thighs are first marinated simply with ginger, garlic and soy sauce. 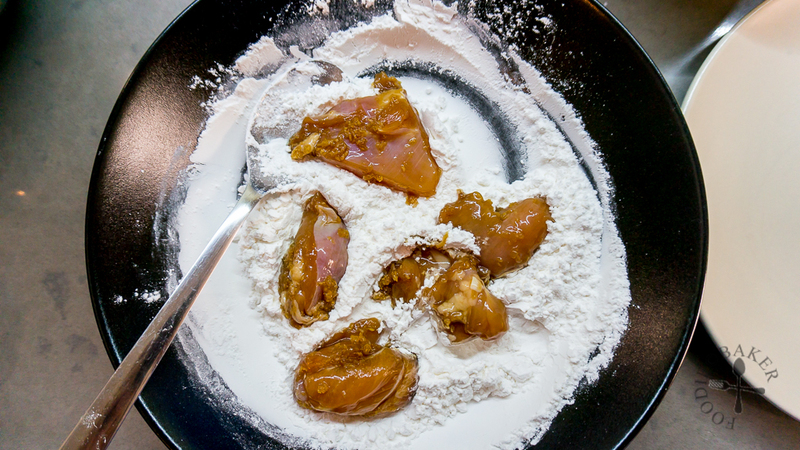 The marinated chicken pieces are then coated with starch – usually potato starch is used but I don’t have it on hand so cornstarch is the next best alternative! First fry: Deep fry the chicken in small batches – 5 to 6 pieces at one go. Second fry: Deep fry everything in very hot oil until the chicken are super crispy. Drain the chicken karaage and serve! I love dipping it in my simple mayo-lemon-sriracha sauce, yum! 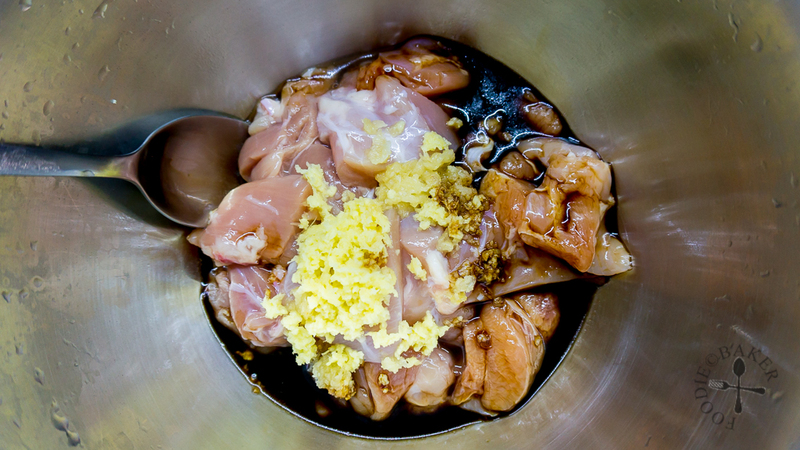 Combine chicken thighs, ginger, garlic and soy sauce in a mixing bowl. Cover and chill in the refrigerator for at least 1 hour, up to 4 hours. Remove the marinated chicken from the refrigerator 30 minutes before cooking to let them come back to room temperature. Place corn starch / potato starch on a shallow bowl. Line and bowl with paper towels to absorb excess oil. Set aside. Heat 2-inch deep of oil in a pot / wok over high heat until it reaches 160-170C / 320-340F. If you don't have a thermometer, insert a wooden spoon or a pair of chopsticks in the oil - if the oil bubbles vigorously around the spoon / chopsticks, the oil is ready for frying. Once the oil is ready, coat a few chicken pieces (I do 5 or 6 at a time) with the corn starch / potato starch and add them into them hot oil. Fry the chicken pieces for about 2 to 3 minutes, flipping frequently, until lightly browned on all sides. If the chicken pieces are browned too quickly, reduce the heat. Remove the cooked chicken pieces with a slotted spoon, drain well and transfer to the bowl lined with paper towels. Use a metal mesh strainer to scoop up any bits of flour or smallish chicken bits so they don't burn in the oil. Repeat until all the chicken pieces are fried. Turn the heat back up to high and heat the oil until it reaches 180C / 360F. Just let the oil continue to heat up for another minute after the oil bubbles vigorously around the wooden spoon / chopsticks. If the oil is smoking, the oil is too hot. Remove from heat and let cool slightly before using. Add all the chicken pieces back into the hot oil and cook for another 30 seconds to 1 minute for the chicken pieces to expel the excess oil absorbed by the chicken pieces. Drain the chicken pieces well and transfer them to the bowl lined with paper towels. 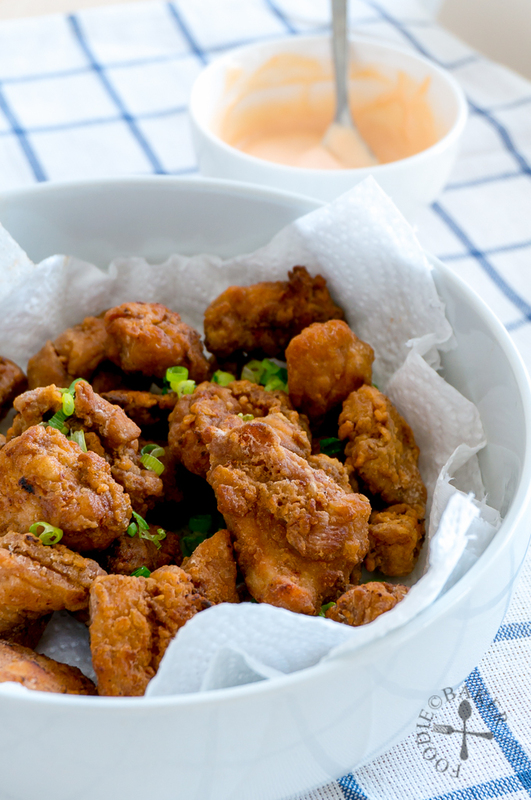 Transfer the chicken pieces to a serving plate and serve with the Dipping Sauce. Stir mayonnaise, sriracha and lemon juice together in a small bowl. Adjust the sauce according to your liking. - Note that cornstarch = corn flour but potato starch is also not the same as potato flour! 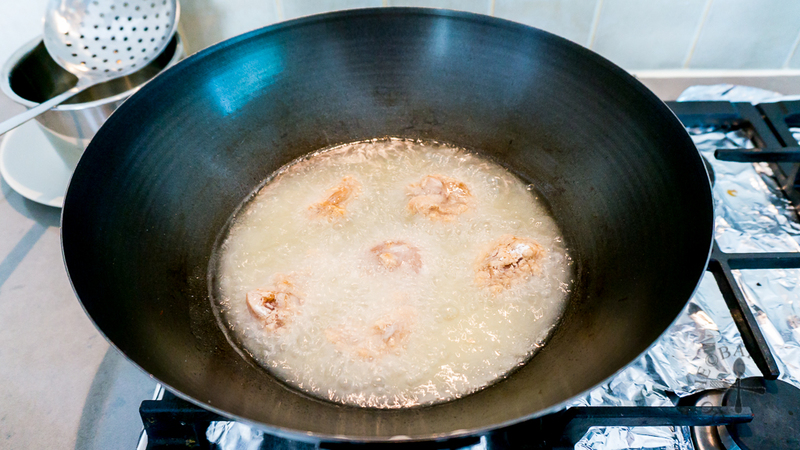 - Frying the chicken in batches will prevent the oil temperature from dropping too much, resulting in oily chicken. Yes, baking can never be the answer to deep-frying. I have so many of your recipes that I want to try too, I need more time and more stomachs to feed! This chicken look absolutely wonderful! !